In the Mercer design, the angles of incidence are a steep 55° angle from the horizontal axis. In an aqueous environment, this is an excellent angle for most solids to overcome friction-forces-per-relative-weight in a liquid carrier, and effectively move solids down to the bottom, without binding on the hopper walls. A 55° compartment by virtue of its design has a larger solids-holding capacity. 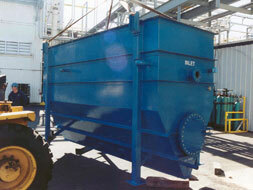 At a given tank width, the steeper the walls in the solids chamber the more solids-holding capacity is available. 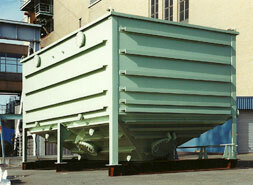 Other Designs: Typical designs supply a solids-holding compartment of 45° or less. 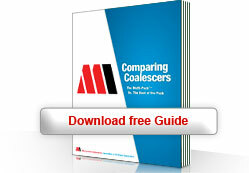 No other design has as much solids-holding capacity as Mercer’s 55°, full-length V-bottom design. 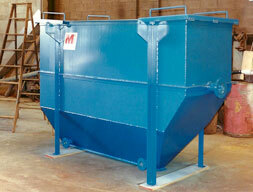 The “V” bottom allows the downward movement of solids to concentrate toward one linear area within the hopper. This is very important in on-going maintenance of the unit. 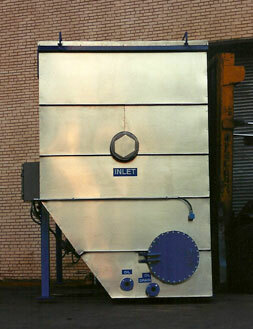 The steep “V” bottom gives the operator the potential to efficiently draw off solids and/or sludge in areas of high solids loading (typically found in the front compartment section as well as underneath the coalescers). Remember, even a light solids loading will cause solids to accumulate quickly. 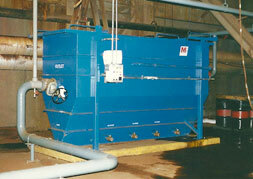 Mercer’s V-bottom design runs the entire flow length of the unit, not just under the coalescer like many brands offer. Also, the hopper section is compartmentalized. This adds strength to the tank design, and also keeps solids from drifting to other areas of the solids chamber, thereby, preventing increased maintenance requirements and reducing the costs associated with sludge disposal. Other Designs: Very few other designs have a full-length “V” or pyramid bottom. Most rectangular units have a “V” or pyramid under the coalescer only, with a flat bottom in all other areas. Mercer’s design has several solids/sludge outlet fittings. Though sludge build-up will be greatest in the areas described above, very fine solids will drift uniformly throughout the bottom area of the entire separator. 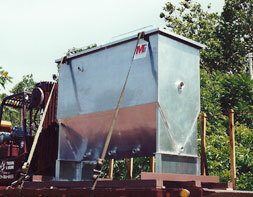 Since bottom solids and sludge tend to move very slowly during the sludge removal process, it is important to have solids/sludge outlets throughout the entire hopper to prevent removal of too much water while draining solids. 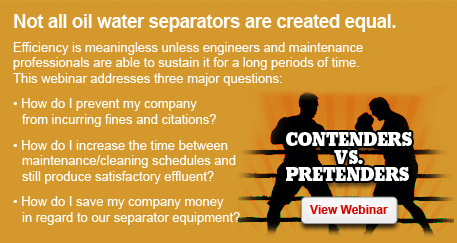 This will save maintenance time and disposal costs, as well. 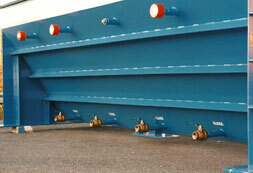 Mercer’s standard unit has five sludge removal drains across the V bottom. Other Designs: Most units available have only one or two sludge outlet ports, resulting in increased costs of disposal due to removal of more water than necessary. Units with too few solids removal fittings have to be taken off line and emptied and the solids have to be access by entering the separator.